Chimeras is Giorgi’s first murder mystery, followed by Mosaics, and Gene Cards, a futuristic thriller that imagines a world without genetic privacy. Chimeras, a murder mystery by the Theoretical Division’s Elena Edi (E.E.) Giorgi, begins on a stiflingly warm day in Los Angeles. “It was one of those hot summer afternoons,” she writes, “with air made of cobwebs and a glare as sharp as pencils.” The story’s detective, Track Presius, soon is trying to solve the disappearance of a young woman working for a private genetics lab and is pulled into several seemingly unrelated murders. Track Presius’ fictional gene activation makes him a so-called epigenetic chimera, where epigenetic refers to the study of heritable changes that are not caused by changes in the DNA sequence and chimera harks back to the monstrous fire-breathing hybrid creature in Greek mythology. Chimeras is Giorgi’s first murder mystery and has since been followed by Mosaics, another Track Presius story, and Gene Cards, a futuristic thriller that imagines a world without privacy, including genetic privacy. 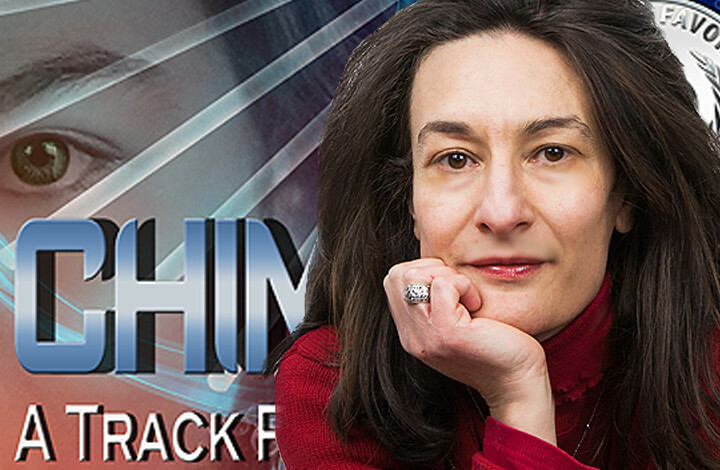 Although Giorgi loved the creative process of developing Chimeras’ genetic twists and turns, she particularly enjoyed researching Track Presius’ life as a member of the Los Angeles Police Department. Giorgi works for the Theoretical Division’s Theoretical Biology and Biophysics group. October, 30 2018 - As a young man, Myles Cartelli of Weapons Fabrication Services (PF-WFS) learned welding, machining and fabricating. The skills he refined working at the Laboratory came in handy when he started modifying off-road vehicles for extreme sports such as rock crawling. September, 25 2018 - Growing up surrounded by a creative family, Michael E. Martinez (Q-6) began to draw and paint. Inspired by the diverse cultures in New Mexico, Michael soon found other outlets for his art, such as t-shirt designs, posters, and customized shoes. August, 28 2017 - In May 2017, Hope Quintana of the Actinide Engineering and Science group (MET-1) earned the title of La Reina de la Fiesta de Santa Fe. Hope intends to bring la fiesta to those who cannot attend.